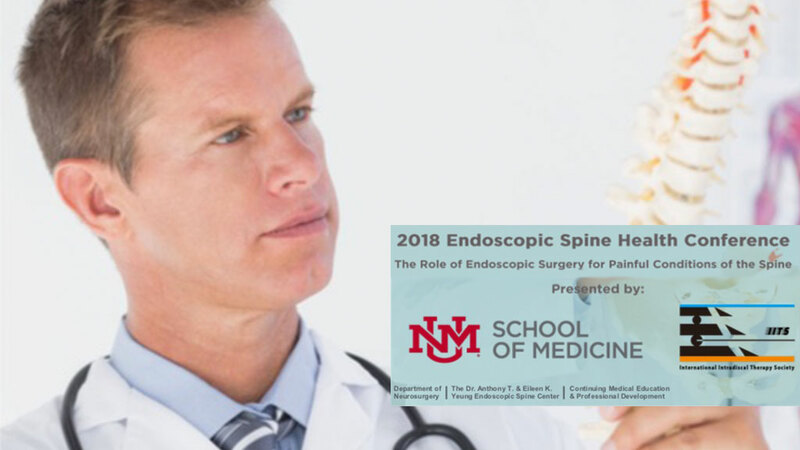 The University of New Mexico School of Medicine and the Anthony and Eileen Yeung Endoscopic Spine Center at UNM sponsored a multidisciplinary spinal health symposium on the role of endoscopic spine surgery for painful conditions of the lumbar and cervical spine June 1-2, 2018 in Albuquerque, New Mexico. A full day of presentations by academic and experienced lifetime members of IITS with extensive experience in endoscopic surgery highlighted and presented their expertise in endoscopic spine surgery, illustrating and sharing their personal innovations and successes for the program. Dr. Clive Chen from Taiwan spoke about successfully establishing three multi-disciplinary clinics in Taiwan and how adding endoscopic spine surgery enhanced the success of his clinics. Dr. Clive Chen presenting his experience with multidisciplinary clinics enhanced by his adoption of endoscopic surgical techniques. Dr. Clive Chen from Taiwan spoke about successfully establishing three multi-disciplinary clinics in Taiwan. Tony Mork demonstrating posterior cervical foraminotomy. Evan Rivers, Course Director, using skeletal model to correlate different surgical approaches. Andrew Roberts, MD became the first non-surgeon to be certified as an academically trained endoscopic spine surgeon in the University of New Mexico’s pilot program. Andrew Roberts, MD elected to further advance his endoscopic training with an extended fellowship with Dr. Anthony Yeung and the Desert Institute for Spine Care. The symposium was followed by a cadaver hands-on program lead by expert experienced faculty demonstrating surgical pain management procedures of dorsal endoscopically-visualized rhizotomy, transforaminal and translaminar lumbar discectomy, and cervical posterior foraminal decompression correlated with anatomic models. The participating faculty also freely shared their clinical and surgical expertise with each other. Andrew Roberts, MD, a pain management anesthesiologist trained by Gabor Racz, became the first non-surgeon to be certified as an academically trained endoscopic spine surgeon in the University of New Mexico’s pilot program. Roberts also authored and published an article in the Journal of Spine titled “Suggestions for a Practical and Progressive Approach to Endoscopic Spine Surgery Training and Privileges” with guidance and input from the UNM faculty and corresponding author Dr. Anthony Yeung (cited in the open access Journal of Spine, May, 2018). Dr. Roberts elected to further advance his endoscopic training with an extended fellowship with Dr. Anthony Yeung and the Desert Institute for Spine Care group for an additional three months, effectively extending his training to 2 year surgical fellowship. Anthony Yeung presenting his honorary presidential address on Foraminotomy vs. Foraminoplasty at the 2018 WCMISST meeting in Chongging, China. The past few years has seen an explosion of endoscopic techniques in Asia and a few dedicated surgeons in the US that has brought endoscopic surgery to a level on par with traditional spinal surgery in Asian countries. At the 6th WCMISST meeting, multiple minimally invasive spine societies jointly sponsored the meeting in Chongging, China, attended by 20 foreign faculty, local faculty and over 800 registrants. The executive committee of WCMISST discussed and approved an Endoscopic spine session supported by IITS to be held in the United States during Jeff Wang’s tenure as President Elect of NASS 2019 in a concurrent session to introduce endoscopic spine to main stream spine care. A symposium proposal will be submitted to NASS for a symposium on the Role and Future of Endoscopic Spine Surgery as an integral part of the MIS Surgical Platform. You are invited to join our email newsletter to get updates, announcements and more.